Khodorkovsky may be pardoned only upon request - Medvedev | Russian Legal Information Agency (RAPSI). MOSCOW, April 26 - RAPSI. President Dmitry Medvedev has stated that he is not entitled to pardon any prisoner, including former YUKOS head Mikhail Khodorkovsky, if he does not plea for a pardon. The president cannot grant a pardon without a formal request from the defendant, Medvedev said in an interview with five major TV channels. Meanwhile, when commenting on the long-term imprisonment of Khodorkovsky and former Menatep head Platon Lebedev, the president said the authorities should address the issue and ask themselves "why so many people are kept in jail." 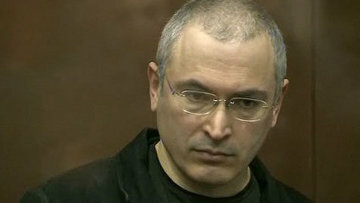 Khodorkovsky and Lebedev were sentenced to eight years behind bars for fraud and tax evasion in 2005. In late 2010, a Moscow district court sentenced them to 14 years in jail for oil theft and money laundering. They were expected to be released in 2017, considering the term they had already served for their convictions from the first trial. However, the Moscow City Court cut their sentences short by one year on May 24, 2011. Khodorkovsky's defense attorney Yuri Shmidt said on April 23 that his client will not request a pardon. 14:43 26/04/2012 President Dmitry Medvedev has stated that he is not entitled to pardon any prisoner, including former YUKOS head Mikhail Khodorkovsky, if he does not plea for a pardon.